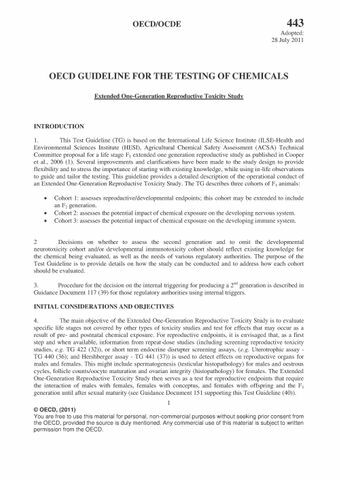 This Test Guideline is designed to provide an evaluation of reproductive and developmental effects that may occur as a result of pre- and postnatal chemical exposure as well as an evaluation of systemic toxicity in pregnant and lactating females and young and adult offspring. In the assay, sexually-mature males and females rodents (parental (P) generation) are exposed to graduated doses of the test substance starting 2 weeks before mating and continuously through mating, gestation and weaning of their pups (F1 generation). At weaning, pups are selected and assigned to cohorts of animals for reproductive/developmental toxicity testing (cohort 1), developmental neurotoxicity testing (cohort 2) and developmental immunotoxicity testing (cohort 3). The F1 offspring receive further treatment with the test substance from weaning to adulthood. Clinical observations and pathology examinations are performed on all animals for signs of toxicity, with special emphasis on the integrity and performance of the male and female reproductive systems and the health, growth, development and function of the offspring. Part of cohort 1 (cohort 1B) may be extended to include an F2 generation; in this case, procedures for F1 animals will be similar to those for the P animals.